It’s no secret that annual performance reviews are not eagerly anticipated by managers or employees. For managers, it’s a ton of work to prepare, and for employees, it’s very nerve-racking. I was so anxious about my first annual performance review that I actually contemplated calling in sick. Looking at things with retrospective glasses isn’t always fun, however, it’s crucial to our growth because tackling and understanding our mistakes is what breeds momentum. Giving feedback to your team is necessary, but should this process really only take place once a year? The short answer is no, and big companies like GE, Adobe, Accenture and Netflix have caught onto this and dropped annual performance reviews altogether. Get A Manager’s Guide To Giving Employee Feedback . It contains everything you need to learn how to give proper feedback to your employees. The most common mistake that managers make when it comes to giving a review is not preparing for it. It’s too often seen as something to get to after all the other important work is done, and not as an important part of the work process itself. Bad managers will hold reviews begrudgingly and without giving it much thought. If you don’t put an honest effort into the review, you can’t expect employees to put an effort into improving. Managers set the precedent for their improvement. This is why frequent check-ins and monthly reviews are infinitely better. In reality, a year is way too long to wait to give your employee a review. So much can slip through the cracks of our memory and whatever’s left might not be relevant anymore. “My job is more important than yours”, which is a dangerous mentality to breed in the workplace. Avoid this huge mistake by offering more frequent feedback sessions that are easier to prepare for and more relevant in time. Another common mistake managers make is looking at what has happened most recently as opposed to looking at the bigger picture. The Recency Effect suggests that the last thing to enter your memory is the most prevalent. Have someone recite a list of 10-15 words to you. Notice that the last group of words received stand out to you the most. So, as a manager, if you aren’t taking the time to document things as you go, or meet with your employees once a month, you are most likely only going to recall the beginning and the end of your employee’s year. But what about everything in between? Imagine only watching the beginning and the end of a movie. You might get a general idea about what’s going on, but you would have missed the entire plot. So, how can you rate it properly? The inherent issue with annual reviews is that the gap between then and now is so large. People have a habit of becoming what you encourage them to be, not what you nag them to be. The purpose of these reviews is as much to encourage your employees as it is to offer constructive criticism, but then again don’t just give a compliment for the sake of giving one. Make sure that the positive feedback your offer is meaningful, not vague. Overall, you are doing great. I like the work you did on that project. You are an asset to the team. I really like the way you handled X issue on your last project. It showed great leadership skills. Your idea to add X to the project really helped it take off. You have great creative input. I noticed you’ve been staying extra hours during our production period and I want you to know it’s really appreciated. Your dedication means a lot to us. Because our brains are trained to latch on to negative feedback, make sure that the positive feedback you are offering has ample weight. It’s also important to use the annual review to not only look behind, but to look ahead. A forward thinking discussion whereby both parties discuss their assignments and responsibilities for achieving success in the coming year or period. Think of it like driving. There are moments when you need to look in the rearview mirror but more importantly, you should look at what’s in front of you. My first-ever performance review was given to me by my supervisor who I had spoken to all of five times throughout the first year at my job. I get the concept of “watching from afar” and “eyes in the back of your head” but there was no way he had any real idea about my contribution. This a huge problem in many workplaces. There’s a large gap between the day-to-day of employees and managers that make it nearly impossible to give effective reviews. You wouldn’t ask a movie critic to review a film he hasn’t seen, so how can a supervisor or manager review an employee with whom they have so little daily contact? It’s a no-brainer. The person who conducts the review should be the manager who has the most face time with the employee on a weekly basis. It’s important to let your employee know in advance not only that they will be having a review, but when the review will be held. It will give them time to mentally prepare. It will give them time to prepare notes about things that they would like to discuss. It lets them feel that you are not squeezing them into a last minute slot, but that they are an important and valid member of the team, worthy of a good, pre-planned chunk of your time. So, out of respect for your employee’s time, make sure to send them a meeting request in advance. I look forward to meeting with you one-on-one to talk about your year. I’ll have some notes prepared but mostly I’d like to hear what you have to say! This will lend a more positive vibe to the meeting and it will remind the employee that ultimately this time is for them. Basing pay on performance reviews is a huge mistake that many companies make. Performance reviews that are tied to compensation create a blame-oriented culture. It’s well known that they reinforce hierarchy, undermine collegiality, work against cooperative problem solving, discourage straight talk, and too easily become politicized. They’re self-defeating and demoralizing for all concerned. Tying the review to compensation pushes the real meaning of the review to the back burner and makes it prominently about money. Ultimately, a review is meant to discuss the performance of the employee, not their salary, but it’s likely that the employee will have a hard time listening to, processing and implementing your feedback because they will only be focused on the end result: whether or not they will be given a raise. I don’t blame them. It’s like waiting to get a test back in high school. How could you focus during class knowing that your test score is just sitting on the desk. The worst mistake that managers can make is not giving any feedback at all. But this happens quite often. Having only one review at the end of the year is bad enough, hence the shift towards frequent one-on-ones where managers can actually help develop their employee’s performance. These one-on-ones are more like “conversations”, removing much of the element of fear implicit in the word “review”. Career conversations — deep, meaningful dialogue coupled with action plans around measurable goals — go a long way in keeping [employees] around for longer. The idea is to keep the communication flowing regularly. Not once a year. And especially not never. Work can get busy, and dependent on the type of company, it can even get crazy, but it’s no excuse. Giving feedback is the bloodline of the workplace. What takes place in these sessions is connection and communication. Two values that all organizations unquestionably need to succeed. There’s nothing that important to go over with them, they’re doing fine. It’s too busy. Getting the work done needs to be the priority. My employees know I have an open door policy, if they want to talk they can come at any time. A good manager knows that touching base is important even if there’s nothing “big” to discuss. Whether it’s to go over a few small issues, give praise for a few small feats, or just catch up on how it’s been going – this time is key to making your employee feel seen, valued and connected. Annual reviews should only be given in addition to monthly feedback sessions. Make sure to come prepared for the review. If you’re not prepared, your feedback will not be helpful and therefore your employee can’t improve. Never forget to give positive recognition to your employees. Reviews are not only meant for criticism, but for encouragement. In addition to looking at the year behind, look ahead and focus on new objectives for the year to come (Performance Preview). As much as recent events stand out in your mind (The Recency Effect), make sure to look at the whole picture. Let your employees know in advance that you’ll be holding a review so they can mentally prepare and bring their own notes along. Make sure that the manager giving the feedback has spent enough time with the employee to give an accurate review. Don’t tie annual reviews to salary. Feedback and compensation should be left separate. Reviews are just as important as the rest of your work. There’s no excuse to skip it, even if there’s nothing pressing to say! 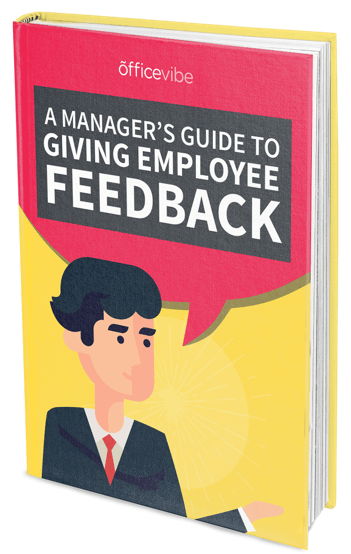 Free Bonus: Download A Manager’s Guide To Giving Employee Feedback to become a better leader. What are your thoughts on annual performance reviews? We’d love to hear what you have to say on this important topic.